Why is food on a stick more fun? While you ponder it, fire up the grill (or grill pan) for these dinner-ready recipes! Flavorful marinated chicken, tender veggies, and a sweet-n-savory sauce... These are the chicken skewers of your dreams! Season cubed chicken with garlic powder, salt, and pepper, and place in a large sealable container (or bag). In a small bowl, mix 3 tbsp. teriyaki sauce with 2 tbsp. orange juice. Add to the container, and thoroughly coat chicken. Seal, and refrigerate for 1 hour. 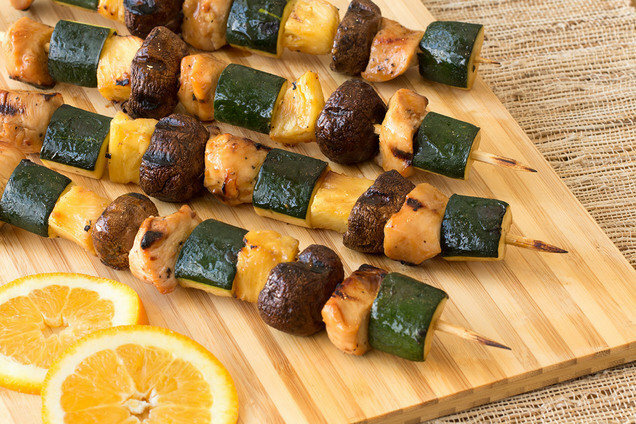 Alternately thread chicken, veggies, and pineapple onto eight skewers, tightly packing the pieces together. Discard excess marinade. Bring a grill sprayed with nonstick spray to medium-high heat. Grill kebabs for 6 minutes with the grill cover down. 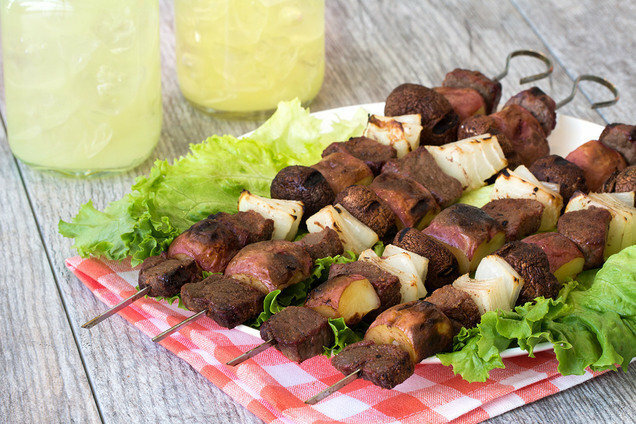 Flip kebabs. With the grill cover down, grill for 6 more minutes, or until chicken is cooked through. In a small bowl, thoroughly mix remaining 3 tbsp. teriyaki sauce with remaining 1 tbsp. orange juice. Drizzle over kebabs. Here's one for the meat 'n potatoes crowd! This is one hearty recipe, folks… Dig in! Place potato pieces in a large microwave-safe bowl with 2 tbsp. water. Cover and microwave for 5 minutes, or until slightly tender. Once cool enough to handle, drain excess water. Place cubed beef in a large bowl. Add garlic powder, onion powder, and paprika. Toss to coat. Alternately thread potato, beef, and veggies onto four skewers, tightly packing the pieces together. Lightly spray with nonstick spray, and sprinkle with 1/4 tsp. each salt and pepper. Flip skewers, and sprinkle with remaining 1/4 tsp. each salt and pepper. Bring a grill sprayed with nonstick spray to medium-high heat. Grill kebabs for 5 minutes with the grill cover down. Flip kebabs. With the grill cover down, grill for 4 - 6 minutes, or until potato and beef are cooked through and veggies are tender and slightly blackened. HG Alternative: Don't feel like firing up the grill? Just break out a grill pan! Use a large skillet lid to loosely cover the pan, and adjust cook times as needed. Today, June 2nd, is National Rotisserie Chicken Day. Pick one up at the supermarket, and use it as a shortcut in this Noodle-Free Chicken Tetrazzini. Get the party started -- click "Send to a Friend," and invite your pals over for grill night!